The M.V. 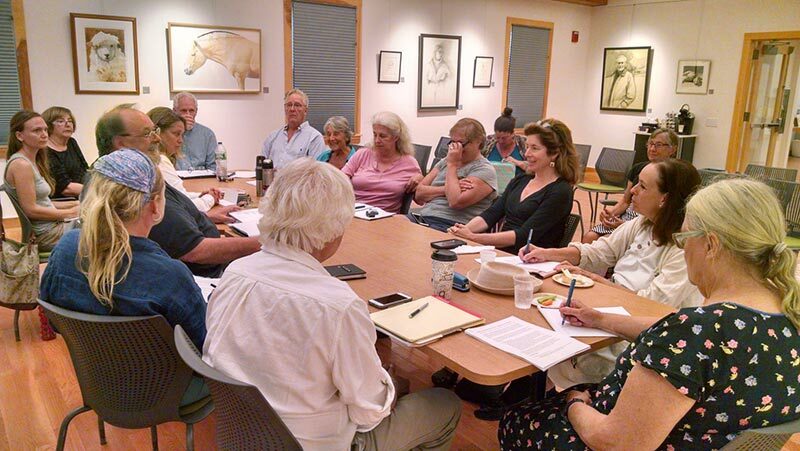 Cultural Council hosts a grantwriting workshop for the arts at the West Tisbury library. For years Vineyard artists, social planners, teachers, and moonlighting storytellers have been given honoraria to help them with their projects. Like sea glass and beer bottle caps, creative people seem to wash up on our shores. Or they were already born here. The Martha’s Vineyard Cultural Council, an offshoot of the larger Massachusetts Cultural Council, is one of many groups eager to help. Why? you might ask. If you look around and study your history, artists have always, well, often been cultivated within their communities. Sometimes there’s even more interest than necessary. “Necessary” is perhaps the wrong word for those of us who feel one can never spend too much on art. Let us say, sometimes there is more interest than usual; consider the devotion lavished by the Medici family of Florence on the likes of Donatello, Masaccio, Fra Angelico, among many others, that basically handed us the glory of Florence itself and, oh yeah! the Renaissance. On a smaller playing field than the Renaissance, here on the Island we have a certain Medici mentality going on at all times. A key sponsor is the Martha’s Vineyard Cultural Council, which for years has assembled its members on a long Sunday in November to evaluate grant proposals and dispense funds to nearly every applicant. Truly, nearly every one. The only disqualification would be a lack of a project’s meaningfulness to the Vineyard community. Eligibility already requires that the grantee reside locally or, failing that, has a local sponsor. Last year’s 47 eligible applications broke down, fiscally, this way: The largest grant was $2,246. The average honorarium, reported the council’s mathematical whiz and treasurer Harvey Beth, was $888. If your desire is to put on puppet shows at all our schools, that amount should cover your expenses. If you plan to produce a feature film, other sources of funding could be helpful. And speaking of movies, a recent success, long funded by MVCC, is Chilmark resident Thomas Bena’s new documentary, “One Big Home.” In the film itself, we view the filmmaker’s 12-year journey as he watches outsize vacation houses going up all around him, and finally comes to a point when his own new house snaps into shape larger than he might have wished for. The film was released on the Island this summer, and now marches off into the larger world where audiences are certain to appreciate a topic of growing (pun intended) concern for all American communities. But Mr. Bena’s potential blockbuster goes beyond the cosy boundaries of most of the MVCC grantees, and in fact, the council prides itself on its ability to help small artistic startups. For example, last year a grant was awarded to the Teen Art Cafe (that was the $2,246 budget), proposed by a Featherstone-sponsored teenager. MV Teens Write was organized by a local author. Another grant subsidized high schoolers’ participation in the Boston Model U.N. Support was rallied for a composer’s project to capture the soundscape of the Vineyard (we know who you are, Dean Rosenthal). Honoraria went to National Fossil Day, a Native American’s Artisans Festival, performances for seniors, a Star Lab Planetarium visit for all Island schools, development of “1854,” a folk opera (this for the hard work of writer Jack Schimmelman, who died last spring). Last Thursday, Sept. 22, at the West Tisbury Library, a grantwriting workshop, staffed by council members and the new chairman, Robert Hauck, was free and open to the public to provide guidance to anyone interested in applying for a tap of the MVCC’s fairy godmother wand. Another candidate on hand last Thursday was Lynn Thorp of Oak Bluffs. Ms. Thorp has already put into place a series on MVTV, channel 13, called “MV Signs Then and Now,” building on the nearly universal use of sign language here on the Island from the mid-1600s to the mid-1900s. The MVCC is seeking new applications for the 2017 grant cycle. Applicants may apply for funding for projects, operating support, ticket subsidy programs, artist residencies, fellowships, student field trips, or other cultural events and activities. Info and the new online form are available at mass-culture.org. Deadline is Oct. 17 so, if you’re following your bliss and could use some financial support, there’s a little Medici money at the MVCC.